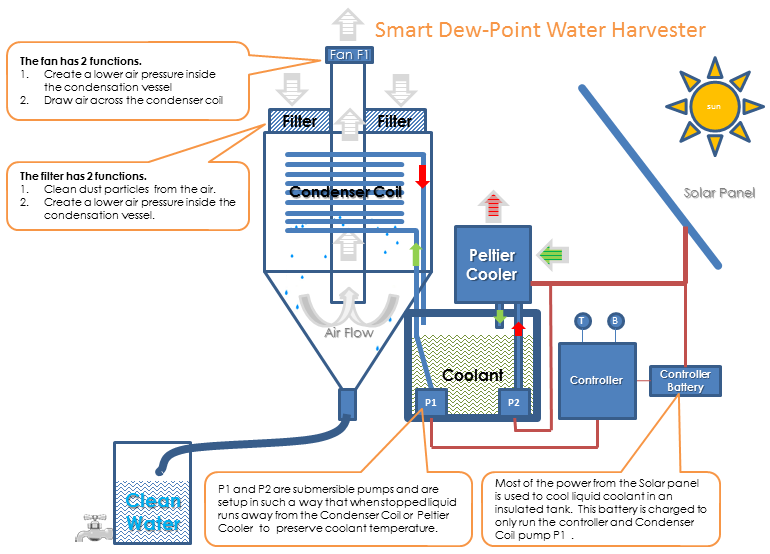 Harvesting clean water from air, using the cold storage of coolant when the sun shines, then using it at optimum dew-point conditions. Dew point is the temperature at which the water vapor in a sample of air at constant barometric pressure condenses into liquid water at the same rate at which it evaporates. At temperatures below the dew point, water will leave the air. The condensed water is called dew when it forms on a solid surface. Harvesting water from air is not a new idea however many systems rely on environmental conditions or large amounts of energy. This system uses what is known about dew point water harvesting and tries to optimize the conditions in the most "energy convenient" way. The system would be powered by a solar/battery system, however rather that just relying on storage batteries most of the solar power would be used to cool liquid coolant in an insulated tank. This cooling process would only run while the sun shines. A controller logs daily barometric pressure, humidity and temperature to calculate when to run the dew point water harvesting at the most optimum time. This was a crude prototype for testing and proof of concept. Which has demonstrated there is significant energy available from a solar panel to cool over 20 litres of liquid well below -4C in less than 6 hours using off-the-shelf peltier coolers. Further that liquids can be stored over 48 hours and used later to dehumidify air when conditions are best and collect water for drinking. Cooling could be significantly improved using a compressor refrigerator unit with better energy efficiency but at a greater cost. Dehumidifying the air could be significantly improved with better vessel and distillation coil design. The system could be scaled up or scaled down. Coolant storage is not required if batteries are used but this also comes at greater cost. The system could be run while the sun shines if sufficient humidity is available and the dehumidifer vessel is appropriately insulated.